Italians refer to old fashioned fruit which have fallen from modern popularity as “frutti dimenticati”, or forgotten fruit. Based on the number of blank stares we get when we try to sell ice cream containing quince, this ancient and perfumed fruit definitely qualifies. 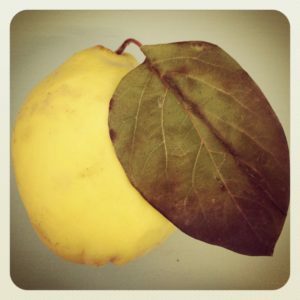 It’s a bit puzzling, because it’s pretty easy to find quinces at supermarkets and greengrocers. American and English friends say that quinces are expensive and hard to find overseas, which is not the case here. The name is not particularly appetizing; I’ve always preferred the Italian ‘mela cotogna’, or even the humour of the French ‘coing’, or Afrikaans ‘kweper’. Maybe the people who know about them try to keep them a delicious secret? For quinces are certainly delicious. This week, we got in the last, precious box of the season from Spaarkloof Farm (better known as Tierhoek Organics, well known for their organic dried fruit). Quinces are perfect cold-season storage fruit. They are hard, and stay hard, for months in a cool place. They give off a honeyed, fruity smell as they slowly ripen, scenting a room. They taste similar to apples, but with a tropical, tangy note which is complex and more rounded. They are a nightmare to process, however, as they are hard enough to resist vegetable peelers, their flesh calls more for an axe than a knife, and their woody cores are tougher still. The trick, I’ve found, is to wash them, removing all their light fuzz, then steam them whole until slightly softened, about 30 minutes. Once cool, they are much more manageable to peel and chop. You can either poach the pieces in a sugar syrup, which turns the fruit a beautiful ruby red, or as I prefer, toss them with a bit of sugar and roast until caramelized. Last year we made small batches of quinces and cream ice cream, our farm cream ice cream studded with chunks of roasted quince. Thus year, we’re kicking it up a notch, and adding our crumble topping, to make quince crumble & cream ice cream. And I will stoically prepare myself and our scoop staff for more blank stares from bewildered customers. 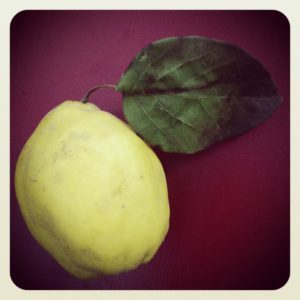 Quince will never be an easy sell; it lacks the familiarity of apple and pear, the instant likeability of chocolate and coffee. But just as we have showcased flavours like Katawba grape, fennel pollen, apricot kernel, and pomelo, we will offer quince, a forgotten flavour more than deserving of its moment in our scoop counter. 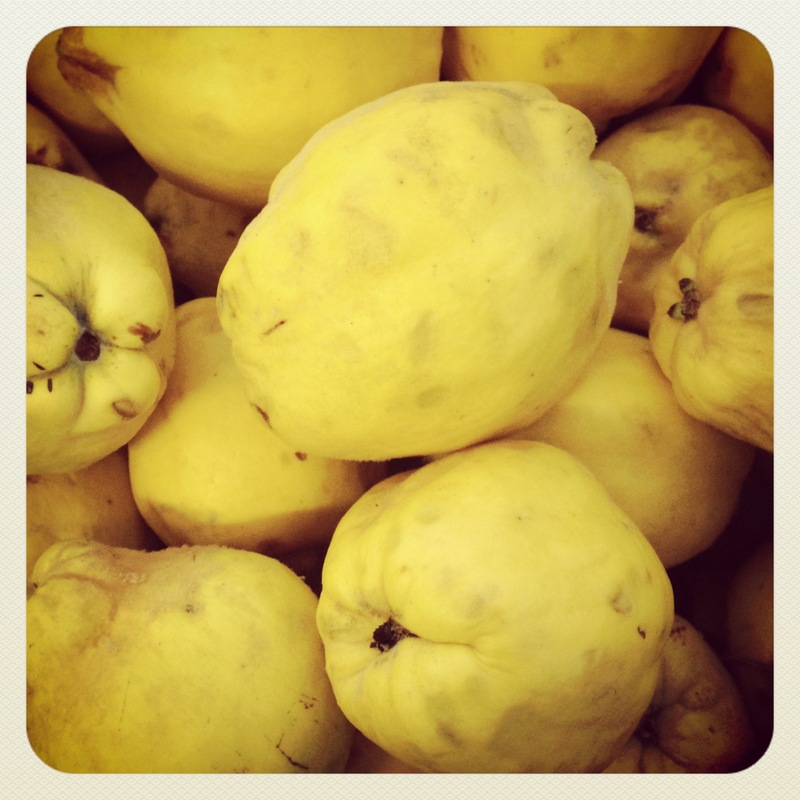 Yes, this winter I think we will win over more followers to the Cult of Quince. Kate is a company director. She spends her time on mentoring our leadership team, product development, new systems, finance, and business strategy. Her favourite ice cream flavours include raspberry choc chip, cookie dough, nectarine, jasmine blossom, toasted almond and berry cheesecake. We also have pints of quince crumble and cream available at the moment, R45/500ml pint. Let us know if you’d like us to keep one aside for you, at one of our stalls, or our Mowbray kitchen! Can I pick up a tub this weekend at your Neighbourgoods stall? I’ll be there, I promise.